9 Feb 42 In Port - Colombo, Ceylon (Sri Lanka) Granted 3 days shore leave. Points of interest at Colombo : Rickshaws, Beer 1R70cents (2/4 per litre). Bannanas growing in street. Breadfruit tree, Cannonball tree, Bhuddist temple, Indian [???] Pineapples, Rubber, Tea, Coconut, Currency - 13 Rupees = £1 stirling. 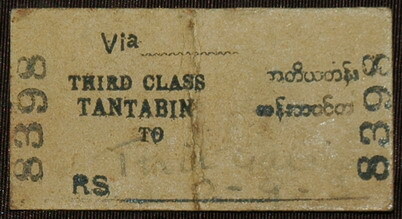 21 Feb 42 Rangoon, Burma (Myanmar) Disembarked. Proceeded to a Leaguer area in a rubber plantation 18th Milestone from Rangoon. A story told to my father by my grandfather years ago was about how when they sailed into Rangoon every other ship was sailing away. It didn't look good at the outset. Apparently the ship had to offload everyone and the equipment regardless, trucks, tanks, provisions etc as it was due elsewhere in the world. Because of beaurocracy and poor orders, they shouldn't have even stopped in Rangoon as they knew they'd be stranded. Very soon after offloading everything, my grandfather said they literally had to push their brand new equipment off of the dock into the harbour. This is a verbal recollection. 24 Feb 42 near Helgu Moved to a Leaguer area on rangoon - Pegu road a few miles past Helgu. 4 Mar 42 Moved to Leaguer on Rangoon road near Pegu road junction. At this time Rangoon was evacuated and demolished - fires could be seen for 20 miles and explosions were terrific. Much bombing here by Japs and plenty of trench digging ground as hard as iron. Plagues of ants as well. Saturday? - Japs set up road block - fortunately cleared by Ghurka troops. Stood to at dawn, but nothing happened. Leaguered up near a village through Jharrawaddy and were visited by Jap bombers again. Prome proceeded to join 2nd Echelon (Indian) at Myingyen. Left Jharawaddy at 8pm & proceeded via Prome on main road to MAndalay. 13 Mar 42 Myingan reached Myingan at 1230 hours. Settled down and was given half 7 A Bde. to administer, i.e 13 LFA RAMC, 414(EY) Bty, 104 RMA, "A" Bty 95 A/T Regt RA + 7 Armd Bde Signals. Echelon moved from Myingyan on Sunday and proceeded per SS"Kanai" [?] up the river Jharawaddy to Shwebo some 180 miles further northwest. Mandalay Stopped at Mandalay one day and narrowly missed Jap bombing. Shwebo Country round Shwebo pretty deadly, bleak and open - only trees - scrubby thorns - no rubber & very little rice. Few banannas and no pineapples. Plenty of palm trees for making toddy. Cholera rife and all drinking water to be boiled. 4 Apr 42 Had injection against Cholera. No cigarettes obtainable & no native cigars, no beer or minerals. Plenty of insect life, flies, mosquitos etc. Guianos, snakes, chamaeleons, tree rats, vultures, crows, sparrows & pigeons fairly plentiful. 26 Apr 42 Shwebo Japanese Bombers visited Shwebo and did some damage. 27 Apr 42 Shwebo Japanese bombers once again. 28 Apr 42 Shwebo More Japanese bombers. 2nd Echelon closed on this day and set off in 2 parties for India. 28 Apr Ordered to move from SHWEBO. Proceeded to station at 1945 hours. 29 Apr Entrained at 0200 hrs and eventually left at 0330 hrs via MADAUNGLA - TANTABIN - TANGON - KANBLU. 30 Apr KYAIKTHIN - ZAWCHUANG - KOTOUNGBO - KAWLIN - WUNTHO - KIN - GYODAUNG. 1 May NANKIN - MEZA - SEYWA - INDAW - NABA. 2 May PINWE - MAWLU - NANSIAUNG - MAWMAN - KADU - MOHNYIN. 3 May PINBAW - MINGON - TAUNGNI - SAMAW - MOGAUNG - NAMTI - MAYAN - PIDAUNG - MYITKYINA, arrived 1600 hours and camped at Depot Burma Rifles. 4 May Laid up at Burma Rifles Depot and prepared kit etc for march into Assam. 6 May Arrived inspection bungalow KAMAING and stayed until daylight. Set off by lorry at 0730 hrs and after a very rough jungle journey reached SHWEDUZUP by 1100 hrs. Went off with lorry and Sgt. Elder (RC. of sigs) to fetch rest of party. After 15 miles rear off-side sprint went and had to march back through pitch dark jungle, a gruelling journey of 6 hours. Reached rest of party at 2300 hrs. 7 May Left SHWEDZUP at 1015 hrs and marched 16 miles through fierce jungle arriving at next rest camp at 1600 hrs. Very hot and dusty - completely fagged out, no square meal for 4 days. 8 May Started to march at 0545 hrs and carried on through same type of wild jungle until 1230 hrs. Halted and had a good rest, a square meal and a bath in a nearby stream. Started to march again and carried on to next camp arriving at approx 2200 hrs. Daily mileage 29 - Feet in pretty bad shape and stomach empty. 9 May Started to march at 0930 hrs and carried on through same old jungle arriving at a tributary of the CHINDWIN at approx 2000 hrs, a distance of 19 miles. Crossed over by bamboo raft and camped for night. Terrific thunderstorm and heavy rain all night. Feet a little better and craving for food somewhat subdued. Now completed 5 days of journey and approximately 123 miles. During this period no bread available, few biscuits (army), no sugar or salt, plenty of rice and a little attar. Spirit still willing but flesh inclined to be weak for lack of square meals. Fortunately no shortage of water and rumour heard that RAF beginning to drop supplies of food and medical stores. 10 May Still raining and 'chucking' it down. Started to march at 1050 hrs and completed 6 miles through worst jungle yet encountered by 1500 hrs. Road under water and mud feet deep everywhere. Crossed the River TAINAN and secured a bamboo hut in camp there. Completely exhausted and very weak for want of food. Boiled a little rice but not enough to satiate hunger. Waited for rest of party to come, but only Colonel Hayes arrived, and 3 B.O.Rs. 11 May Rest of party arrived and after a long wait during which my craving for food increased to a point beyond endurance, breakfast was made of chapattes, tinned fish and tinned cheese, a meal which tasted like food of the gods. Set off to march again at 1100 hrs and covered next 9 miles to camp by 1600 hrs. Again a journey through a sea of mud, but a little better than yesterday. Secured a bamboo hut and got a good rest and a bath in the river flowing nearby. 7 days passed and 138 miles completed. Feet now in good condition and spirits high. 12 May Pouring with rain. Breakfasted on Parates and a little marmalade. Rain stopped about 9. Started to march at 1000 hrs. Very slow progress owing to heavy going for bullock cart which was carrying what few rations we had. Road just one sea of mud and water except for odd dry stretches on high ground. Bullocks gave out at 1600 hrs and cart had to be abandoned. Split rations up to carry and headed for camp which was not reached until 2100 hrs after a heart-breaking, soul-destroying plod through terrible jungle in the pitch dark. Plenty of food now. Our dream came true as at this camp RAF were dropping lots of bully biscuits and tinned stuff. Feet rather sore, but spirits high and otherwise physically fit. 152 miles now covered. 13 May Day of rest. "Sharbosh". [urdu - meaning very, very good]. Had an issue of cigarettes, bully and biscuits, a swim in the river and some jolly good meals. 14 May Breakfasted on Chapates and tinned sausage. Started to march at 0800 hrs and met most terrible hills. Path only wide enough for single file but plenty of water en-route. Lots of sweat lost today although most of path in shade. Some coolies which the Colonel hired before starting failed to turn up and only 4 eventually reported to carry his kit and our rations.. Rested at 1500 hrs and then carried on until dark. Camped on roadside with Ghurkas. Very tired but still in good trim. 15 May Started to march at 0800 hrs and passed through camp which we had intended to reach the day before at 0820 hrs. It was as well that we camped 'afar off' as cholera was rife in that camp and there were already several corpses laid out. Continued marching through very hilly country and covered 13 miles before packing in for night. Had a good rest and swim in a very icy cold mountain pool. Feet very good and spirits high. Total miles now covered 184. During the night a quarrel arose between two Sikh Sepoys of the Burma Frontier Force and one shot the other with a .303 rifle at point blank range before our very eyes. 16 May Dead Sikh still where he had dropped. Col. Hayes ordered the Jemadar i/c to have him buried or otherwise disposed of according to their religious beliefs. This was done and we started to march at 0715 hrs. Most of the morning all downhill going. Saw several corpses en-route evidently through dysentry or cholera. Rained very hard after lunch time and had to ford a very wide stream about 2' 6" deep. Road very muddy. Reached next camp at 1945 hrs but could get no sleep for insect bites, primarily the mosquito and bamboo gnat. 17 May Raining heavy. Started to march at 12 noon and got thoroughly wet through. Stopped at 1630 hrs and built a fire and dried clothes as much as possible, but unable to sleep for mosquitos and other winged pests. A terrible night. Had had several deep streams to ford during day and passed many more dead bodies. 18 May Started to march at 0815 hrs and got on well although 'cuds' [urdu - meaning 'hills'] very steep and muddy and difficult. Still more dead bodies. Rained hard during afternoon and after everybody was thoroughly wet through, cold and miserable a temporary camp was made at the top of a small mountain range some 4,500ft high. Now no rations left, last eaten at breakfast which consisted of 1 biscuit and 1 small sausage. Before going to sleep as tin of bully and some biscuits were given to us by fellow travellers to make an evening meal. A cold miserable night, 3 nights now and hardly any sleep. LEDO still 70 miles away and cholera everywhere. Feet good and spirits high, but stomach awfully empty. 19 May Started to march at 0900 hrs after a breakfast of 1/2 biscuit and a small spoonful of bully and cauliflower brought by one belated member of our party who had taken all night to catch us up. Reached a camp at the next river 8 1/2 miles on by 1400 hrs, but no rations there. Advised to carry on a further 13 1/2 miles to NAMPONG camp - the first properly organised military camp on the ASSAM side of the border. Started out but rain forced us to camp in a coolie hut in the jungle after 8 miles. Rained very heavy most of night, but after extracting the cordite from some .45 rounds a small fire was lit on which we cooked a cupful of dhal and a small chicken which the Colonel unknown to us had bought from some natives during the day. Spent a cold miserable night and no signs of the rain abating. 20 May Started to march at 1000 hrs and after 5 miles reached NAMPONG camp by 3 in the afternoon. Plenty of rations here all ready cooked. Had agood meal of dhal and rice and a good rest. Still more dead bodies encountered on way. 21 May Started to march at 1030 hrs and reached next camp at 1400 hrs after 8 miles of the most awful mud i have ever seen. Met at Camp Guardroom by a steaming hot mug of tea and a good cooked meal of dhal, rice and potato stew. 'Laks' of mud [urdu - meaning large amount] all over the place but spirits very high and for once stomach full. LEDO now only 35 miles away. Spent a sleepless night because of mosquitos and bamboo gnats. PRobably the large supper of the same stew helped the sleeplessness. 22 May After a breakfast of dhal and rice and stewed goat flesh started to march at 0620 hrs, reached 4 mile supply camp by 0840 and had a mug of tea. Carried on and reached the 12 mile camp at 1220 hrs. Very heavy rain again, but track fairly good though muddy on surface; fortunately most of it was on the level. Passed over a very good suspension bridge made of two steel ropes on which the bamboo bridge had been constructed. This spanned a gorge about 150 yards wide with a fast flowing river underneath. A most horrible death if the bridge had given way. Only one person allowed over at a time and an armed sentry at each side to see this was enforced. Cooked our own meal in the evening but not being satisfied, paid some Naga coolies to cook us yet a further meal and make us some rice bread as haversack rations for next day. Later on it was discovered there was a supper cooked by camp staff so partook of that as well and slept very heavy all night. 23 May Started to march at 0645 hrs after a good breakfast of dhal and rice and made 4 mile camp by 0900 hrs. Had some more food there and set out to make the next camp a further 7 miles on by the afternoon. Arrived dead beat and completely worn out. Plenty of food here but no sleep as camp site simply one breeding place of every winged pest in the country. A night of torture. Newspaper cutting from 'news of the world' describing the forced march. A story told to my father by my grandfather years ago was how when they were marching though the jungle at one point they kept losing stragglers. They were being followed by Japanese snipers who were picking the troops off one at a time. The sniper were apparently being tipped off by the bhuddist monks that sometimes travelled with their groups or that they encountered. It is thought that they did this under duress with threats by the Japanese. One recollection is of their party spotting a jap in a tree and shooting him out of it. From that point onwards, the monks (who were often armed themselves) could not be trusted and there were instances of them being shot. This is a verbal recollection. 4 Jun 42 Barrackpore Arrived. Very hot here and opressive. 11 Jun 42 Admitted B.M.H Barrackpore on a Thursday with a temperature of 105 degrees (f), Diagnosis Malaria MT. 23 Jun 42 Dohra Don Arrived, admitted to 17th? B.G.H - A good hospital and very nice sisters especially Sister Wainwright. Developed Pleurasy after Malaria and a shin disease consisting of jungle sores, Impetigo and septic prickly heat. Doctors' sick leave card, written on the back of part of some regimental orders for the hospital. Postal Receipt for Bangalore - maybe a telegram or a parcel? Stamped with EXPERIMENTAL P.O ?? A handwritten poem, not sure who the author was, it doesn't look like my grandfathers handwriting however. from dawn till dusk the soldiers toil. sweat and die, for die we must. when water from the wells we sip. deaths call boys these killers all. jackals scream, the grunt of boar. death stalks the shade of jungle path. hopes of sleep, long since flown. blast bloody holes in heart and lung. heads are bared round lonely mound. earths rich gain but Englands loss. Englands smile so rich and fair. soft red lips to kiss again. just lazy, slumbrous English nights.